The company charges in with a title based on one of its extreme sports events. Austrian caffeine-merchant Red Bull is known for staging extreme sports events, such as the Red Bull Air Race, the Red Bull Flugtag, and the highly extreme paper plane championship Red Bull Paperwings. Now, it seems Red Bull wants to appeal to the audience that prefers to simulate extreme sports in the comfort of their living rooms instead. It will be co-publishing a video game for XBLA this winter, in conjunction with Microsoft Studios. 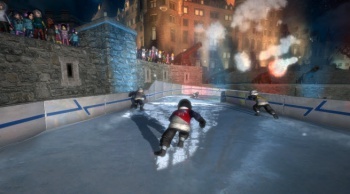 Red Bull Crashed Ice Kinect is based on the winter sporting event conceived by the company. The sport appears to involve several heavily padded skaters hurtling down an icy obstacle course at high speeds, with falls and collisions coming as standard. The motion-based title allows for four people shuffling towards their TVs via local split-screen and online multiplayer. Development will be handled by Austrian company Bongfish, responsible for the snowboarding series Stoked Rider and the free XBLA shooter Harms Way, which was sponsored by Frito-Lay. Director Michael Putz says that the project is a great opportunity for any developer. "Combining the nature of this unique sport with the power of Kinect should result in an outstanding experience and evolve digital sports to its next level." Crashed Ice Kinect is not Red Bull's only product-based game: Red Bull Air Race is available on iOS, and the event also has an appearance in Flight Simulator X as a side mission.